SRT® Motorsports is honoring the Dodge Viper’s racing heritage by molting its ‘skin’ and returning to the Viper’s classic red and white livery, beginning at the upcoming Sahlen’s Six Hours of the Glen race weekend, June 27-29, at New York’s Watkins Glen International circuit. In addition to the new livery, the team is carrying a special 100th anniversary logo on both IMSA TUDOR Vipers. 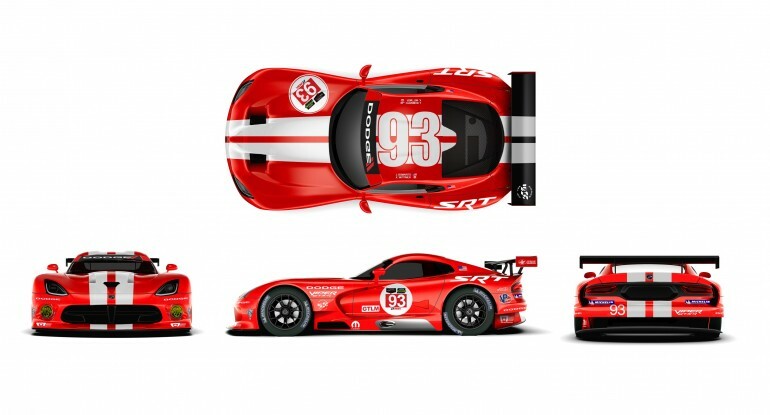 The classic-colored Dodge Viper SRT GTS-R will first take to the track on Friday, June 27, for the initial practice for the Sahlen’s Six Hours of the Glen race weekend. The third endurance race of the 2014 IMSA TUDOR season, part of the North American Endurance Cup (NAEC), will take place at Watkins Glen International on Sunday, June 29, starting at 11:15 a.m. EDT.